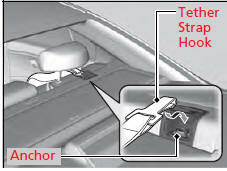 A LATCH-compatible child seat can be installed in either of the two outer rear seats. 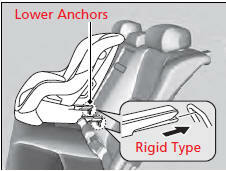 A child seat is attached to the lower anchors with either the rigid or flexible type of connectors. 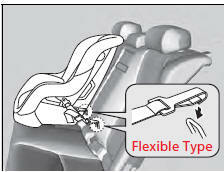 -When installing the child seat, make sure that the lower anchors are not obstructed by the seat belt or any other object. For your child’s safety, when using a child seat installed using the LATCH system, make sure that the seat is properly secured to the vehicle. 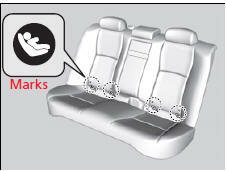 A child seat that is not properly secured will not adequately protect a child in a crash and may cause injury to the child or other vehicle occupants.